First heard of this newest spot was from my friend, and then was broacasted in the TV news, featuring new reservoir, the bridge where visitors may have a stroll, and big green patch where visitors may enjoy a picnic there. A FOC place for the residents! This majestic dam was was officially opened on 1 Nov 2008. A very new place for you to explore! Open daily, and it’s FOC! Park your car at the open space parking lots where parking is FOC. Or, take a MRT down to Marina Bay, and from Marina Bay MRT station, there is a free shuttle bus to the Marina Barrage at 30 min interval. Yes, the shuttle bus is FOC! 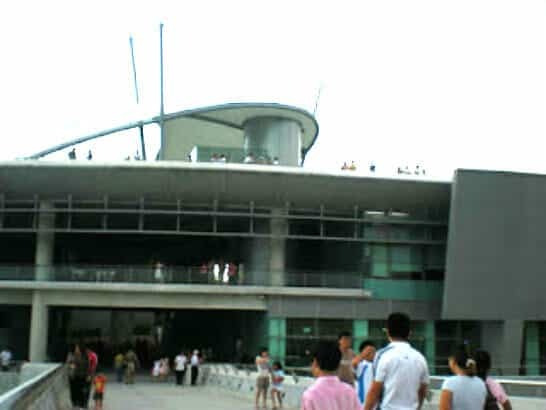 Walk to the bridge, you will get to enjoy the magnificent view of the coastline and some oil vessels on your right, and the beautiful Singapore Flyer on your left! 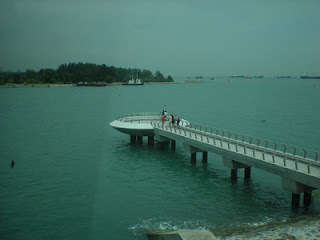 There is also a small platform extended out to the sea next to the bridge, for a view of the sea and to enjoy the breeze. Take the stairs or elevator to 3rd floor, you will reach the wide green patch where couples and old folks will take a stroll and kids will run around. Some families tends to picnic there, when weather is not too hot or sunny. There was no picnic family on the day (last Saturday) we visited there as it was drizzling for about 10 min long. Overall weather was not too bad though, it was windy and not too hot even though it was at about 4pm+. After that, we moved down to 2nd floor where the gallery is located. 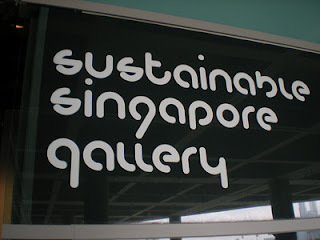 Again, this Sustainable Singapore Gallery is FOC! Remember, gallery is closed on Tuesday. 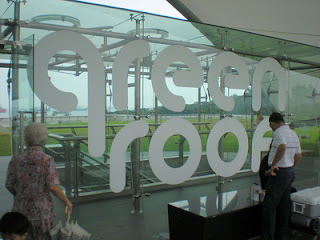 Inside the gallery, showcasing Singapore’s effort towards environmental sustainability. 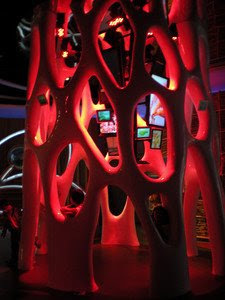 This colour-changing “Organic Tree” with many LCD screens in it. It was in red, when this photo was taken. It will then change to blue and green, if I was not mistaken. Step on the glass flooring, underneath is the ‘miniature’ Singapore land, you can imagine yourself as a bird flying in the sky over the land….. 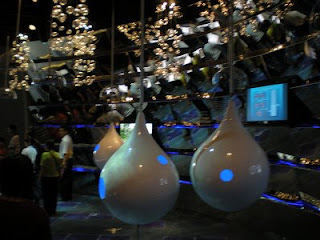 This gallery is educational, for both adults and older children. 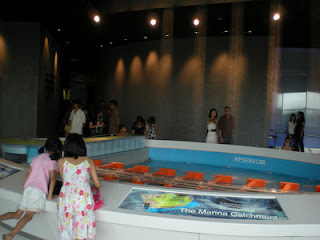 Childten would enjoy themselves with the latest gadgets on how the history of Singapore River was shown, with the sliding TV and e-book. 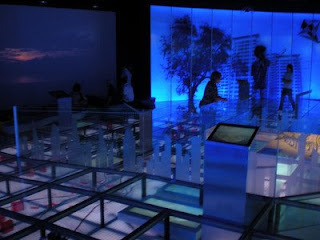 There is also a corner where some LCDs were display for loading of information on places to visit in Singapore. 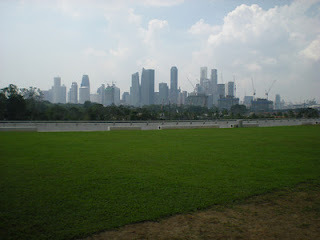 It is also a tool for you to plan your visits in Singapore! Interesting. This is the most exciting gallery inside, a model of the barrage demonstrating how the barrage works, and how the purpose of flood control takes place. 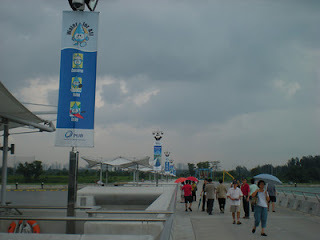 If you were to visit during weekend, I will recommend you to go at about 2pm to 5pm. After 5pm, crowd will be expected. Not sure how is it in the morning though.. for you to explore, then! 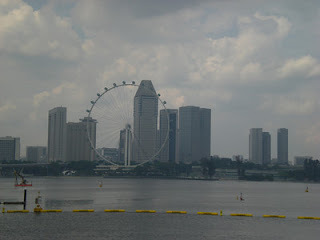 That looks incredible.. I’ve been around the far east but have not gotten to Singapore yet.. hope to go some day soon. You must be so proud of the result turned out for tis Singapore’s icon!